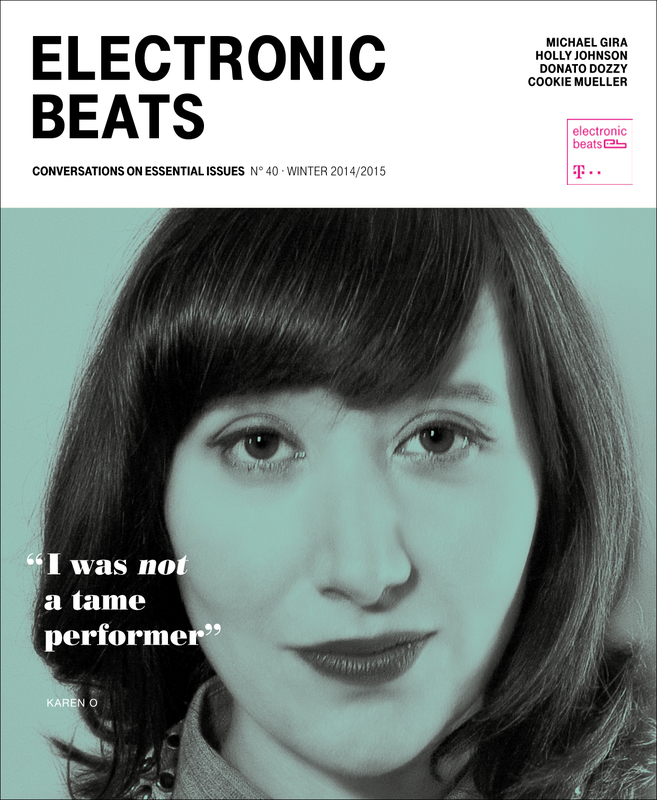 The Winter 2014/2015 edition of Electronic Beats Magazine is officially out! The latest issue features conversations with the likes of Karen O (who recently performed at an EB show in Berlin), hypnotic techno luminary Donato Dozzy, and Swans frontman Michael Gira. Additionally, we travelled to Antwerp and America in search of dance music’s origins in New Beat and urban roller skating communities, respectively. But we didn’t neglect our home turf, as we also delved into the local Berlin scene to take a closer look at techno-futuristic fashion outlet Darklands and one of the city’s most exciting parties, Gegen. The first glimpse of what’s inside comes from Editor in Chief A.J. Samuels, who previewed the magazine with stalwart producer Roman Flügel, whose last album was covered in our previous issue. In this issue of Electronic Beats, we have decided to take a closer look at how the world outside of music shapes so much of what we listen to—that is, beyond narratives of new technology guiding various electronic subgenres. In the first part of our new series “Sound in Motion,” we survey how African American roller skating communities have changed dance music’s groove. We also traveled to avant-garde breeding ground Antwerp to learn about the importance of good highways in the development of Belgian new beat. Everywhere we looked, art seemed to imitate, and then innovate, life—from Arca’s LP namesake Xen, a character created from secret online personas, to Michael Gira’s time spent in an Israeli jail. Here we present our thoughts on music made outside the vacuum, with guest previewer Roman Flügel. A.J. Samuels: Karen O, who graces the cover of this issue, recently released an album dedicated to a series of fleeting crushes she had years ago titled Crush Songs. One of the intriguing aspects for me was how much these tracks were able to communicate in an extremely short format—some under a minute. Roman Flügel: You know, I was never a huge fan of the Yeah Yeah Yeahs, but I enjoyed Karen O’s Crush Songs enormously. Aside from the overall intimacy of the production and subject, I also fell in love with the lengths. It reminded me a bit of The Magnetic Field’s 69 Love Songs, which is one of my favorite albums of all time and also about unrequited love. AS: That’s true, but with 69 Love Songs I have the impression that Stephin Merritt sings a lot about relationships that didn’t work out; the songs are humorous but dark. Karen O almost seems to celebrate the unrequitedness. RF: Yeah, maybe it’s more about the length. You know, these days people record long songs just because they can, but this is a beautiful rebellion against that. I tried something similar under my Eight Miles High moniker a few years ago, but most people wondered what the hell was going on. AS: In this issue we have decided to focus on non-musical phenomena that have been key influences on music—for example, the impact of African American roller skating communities on American dance music. How do you understand the influence of experiences you’ve had outside of music on the records you make? RF: First, reading about roller skating in this issue really made it clear to me how much the groove and feel of it effected certain kinds of disco, post-disco, and hip-hop production, which is fascinating. As for my own “outside” influences: I was surrounded by music since I was a kid. The radio, MTV, my parents’ record collection—these were all pretty inescapable. Not too long ago I met up in Hamburg with Michael Rother, a former member of NEU!, Harmonia, and early Kraftwerk, and he explained to me how independent his approach to music was in the seventies and still is today. He expressed the need to isolate himself from musical influences to look into his very musical core. I think it shows a real generation gap. Music today often sounds like a puzzle with a thousand different influences from a thousand different sources. You would need a kind of musical psychotherapy to figure out what is what. Other artists, like Michael Gira from Swans, are pretty aware of their external influences and experiences—which he goes into detail about in your interview. On the one hand, he recounts his time reading Marquis de Sade and Oscar Wilde in an Israeli jail, which is pretty serious. On the other hand, he can also laugh at himself and his ability to piss people off. I appreciate that. But it did surprise me how little he respects electronic music. He doesn’t even think a lot of it is music! AS: Which is ironic, considering how often Swans get namechecked by techno and electronic industrial acts. RF: I remember how important Swans were for one of the largest techno distributors in Germany in the nineties, which was Siggi Zahn from Neuton. And the first Underground Resistance records weren’t far away from them either. But also, Gira’s description of his creative process—the need to be engulfed in sound, the need to experience it at extremely high volumes—to me, that’s what walking into the Berghain is today. Also, my first time entering a techno club was exactly that. Omen in Frankfurt was actually the first proper techno club in Germany, and I remember feeling what I was hearing with every single part of my body. It’s a different state of consciousness.